Yes, what do we do with these scapes? @Scorpio Rising wrote: Yes, what do we do with these scapes? SR ... here is what I posted earlier today on the "What are you eating from your garden today" thread. "For our lunch today I had to do something with the garlic scapes. I harvested some from the SFG (there are still lots left) and chopped them up. To that I added some chopped multiplier onion from the SFG. I then sautéed the scapes and onions in olive oil. When ready I poured in lightly whisked eggs and scrambled them together with the scapes and onions. When served, we added freshly ground sea salt and pepper to taste. We ate this with hot buttered toast. A very simple recipe but it was good." There are many other things that can be done with scapes. @sanderson wrote: Fiz, Congrats on the carrots. Sometimes undersized carrots can be so tasty. 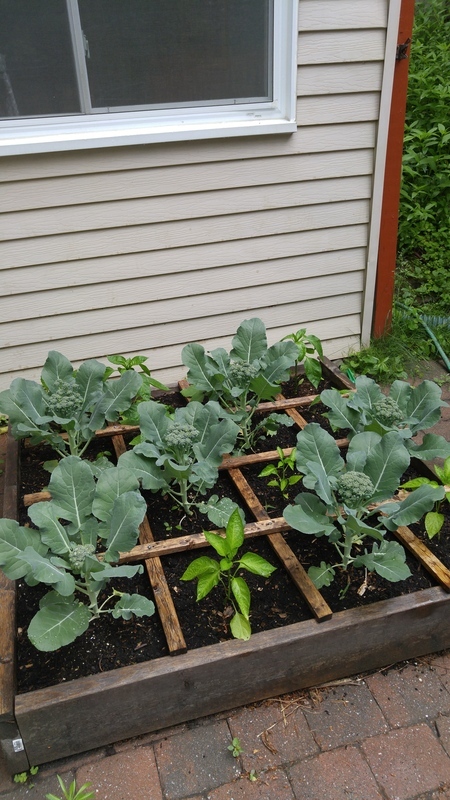 On the topic of kids, I am growing most of my veggies for my little guy, who will be 4 in September. He likes store bought baby carrots and I had picked one of the round carrots from this batch a couple of weeks ago and gave him a piece and he asked for more, which made me happy. But the other carrots weren't ready yet so I told him he would have to wait a couple of weeks. So imagine my surprise and horror when I finally pick those carrots and proudly give him one to eat all for himself, and I watch him chew it up, make a face and spit it out! I was like, you know it took that little carrot more than 2 months to grow for you and you just spit it out in 3 seconds?? It was funny but mortifying at the same time haha. Next time I will give him a piece first before handing over a whole one. I love how growing your own food gives you such an appreciation for it. TD, your water lilies, pink and white are so beautiful. One can appreciate their perfection and it is wonderful that you can enjoy them because of being able to caption them on your camera. I regret that years ago we could not do that and just at the touch of a button. There are many good things to do with progress, all is not bad. Fiz, perhaps those carrots were past their prime? Just like lettuce can get bitter with a bit too much growing time. Which reminds me to check my lettuce that tasted so good when I picked some leaves the other day. Scorpio, no scapes for me this year. I think my garlic, and my tulips, got waterlogged and I lost them all. I will have to start again this fall. Yesterday I finally bought myself the new mower I have been promising myself for the last two years. It is Greenworks 40v 16" 60-1782 using an electric cord. I would have liked a battery operated one but that would have been too expensive for me and too heavy etc. It cost a total of $232.95 Can and it was on special, saving me $50 plus taxes and in addition I got a $30 bonus Certificate to spend in Canadian Tire. My friends down the road took me to collect it which meant saving $25 delivery fee. So later today I will unpack it after I have finished reading all about it. My lawn can wait a day or so. I have opened the box and it looks as though I can lift it straight out, flip the handles out, plug it in and start right away. The comparisons with my old one? I will not have to take the wheels off to alter the height of the cut then screw then back on, the new one is a one touch lever, it also has a mulching blade and a grass catcher. I tried the new one on the store and the handle height is fine for my short stature, in the old one there was not a straight line from the handle and up through my arms so that one loses push. The wheels are bigger so that they will go over the grass more easily. The new one looks prettier. The Weather: Right now it is 20C/69F rising to 28C/82F. Next two days it will be 32C/90F and 35C/95F. We have four days of this so I started watering last night. While have have been on this forum, I have just checked the current temperature and it has already risen to 24C so I had better get out and do something before I wilt like my lettuce. KJ, that is too bad about your garlic! And tulips, LOL! Kelejan, you could be right. I thought they tasted good but they did seem a bit dry. I think since they were indoors for so long and under the shade of a tomato plant, they took too long to grow and we're not ideal when picked. On the bright side, some of my carrot week carrots have started to orange up! One of them seems to be growing sideways, though, lol. Not sure why, there doesn't seem to be a blockage directly under the carrot. Silly carrot. I've also got a few tomato fruits starting to grow and one eggplant has also started to bulge as well. Exciting times on my little terrace! KJ ... That's great news concerning your new lawnmower . Sorry to hear about the demise of your garlic. We have two of our grandchildren (boy 9 and girl 6) over at our house for a sleepover. I just took them out to see the SFG. They are all over the Butter King Lettuce (i.e., eating the leaves as I take them off the plants) and Red Radishes. Great to see them enjoying the crops. It rained here for a good part of the day and now going out to the SFG in the evening and with high humidity is like going into the jungle. I was concerned that some of the mosquitoes were big enough to carry away the grandkids. I know I fed those insects well with my own blood. Ottawa is at one end of the Rideau Canal which was completed in 1832. The canal was built as a preventive military measure in the event that the USA invaded what was then the British Colony of Upper Canada. What many people do not know is that during the building of the canal many of the workers got malaria and many died! TD, The water lilies are beautiful! KJ, I'm happy for you with your new electric mower! A very satisfying day with my new electric mower. I lifted it out of the box and within ten minutes it was in working order. Most of those ten minutes were spent unwrapping the plastic that was protecting the handles. I then mowed all the grass using the mulching mode. I do not see me using the grass catcher as I have always returned the clipping s to the lawn. It was quite light to push as a lot of the body was made of a hard plastic; I actually was able to do everything in one go with not even a break in between. It also did a nice smooth cut. Later on I picked two pounds of strawberries from my newer bed, the second year one. Only a handful from the older bed which goes into retirement as soon as the strawberries are finished. Tomorrow I intend to dig up the baby tulip bulbs that had survived the winter. They did not flower this year. It was lucky that all these baby bulbs attached to their parent had been detached and planted in a bed of their own which has insured their survival. This is where I wished I had done the same with the garlic seeds? that looked like small marbles as they would have grown into garlic bulbs eventually. Put the hose on two of the beds tonight and have given them a good soaking. Then maybe catch up on the weeding, a bit at a time. I am not looking forward to several days of 35C, but hope to get in some early hours and hoping the bears will not be around. Tonight should be cool enough for a good night's sleep followed by a gradual increase in night temps. Pal the cat sleeps elsewhere now it is getting warmer and I do not blame him. We had two of the grandkids stay with us overnight. We took them for a nice bike ride this morning. We are blessed with some good bicycle paths nearby as well as a park at the end of our street that has a bike path through a wooded area, a playground, six soccer fields and an inflated indoor sports dome. After the biking I am feeling my age. Both kids insisted on taking home a bag each of lettuce leaves cut from the Butter King Lettuce plants in the SFG. Some of our neighbours have Japanese Lilacs which are now blooming. They are killing me with allergies. My eyes are watering and itchy and my head is all stuffed up. But I have to brush aside these conditions and work on the trellis for the new 3x6. Has any one ever successfully grown daikon? I'm curious as to whether I can get it to behave right in the Maritimes. @SwampTroll wrote: Has any one ever successfully grown daikon? I'm curious as to whether I can get it to behave right in the Maritimes. I have Daikon Radishes growing in my SFG right now. They actually self-sowed from last year. The problem I have is that I do not get good roots. But they grow fantastic tops and the seed pods are delicious. I'm wondering if I started with the wrong kind of seeds. I used seeds that I bought for growing microgreens indoors. Someone else mentioned that they do not get good roots with the Spring planting of Daikon but they do with the later sowing for Fall harvesting. My further understanding is that when the radishes bolt (go to flower) all the energy goes the part of the plant above ground and no radish forms underground. My daikons bolt as soon as there is any warmth in the weather. Mine failed yet again. I will try one more time in the fall, then give up and stick with the little round ones. I have never done well with any of the icicle varieties and they take twice as long to grow as the globes, so they really aren't practical for me, even though we love them. Hi, Swamp Troll. May I suggest that you put your headline of "Daikon" in the body of the post as the thread is called Canadian Region? Thank you kindly. I always believe that a plant's aim in life is to reproduce by seeds, so that once seeds have formed, any other growth ceases. One reason to dead head flowers etc. How is the weather down in New Brunswick? Here in British Columbia where I live, we are heading for 35C plus in the next two days. Mine do better in the fall,if you are interested in root. Right now, mine are bolting and making the most delicious seed pods ever! 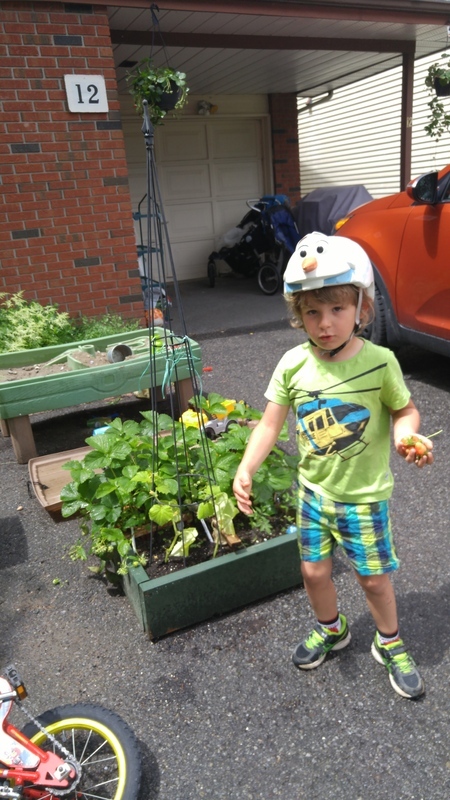 My son is doing very well with his two square feet of strawberries. Here is today's harvest. We have to pick them before they get red or the birds, potato bugs and mice get them. That's his green SFG behind him. This is pic of one of the SF gardens in my backyard. It looks like the broccoli are just about ready to harvest. They aren't very big, but it looks like there are lots of side shoots. The peppers are also starting to get small buds. Other plants that are doing well are the strawberries (which I am harvesting); the tomatoes (flowering); the lettuce (which we need to eat quickly before it get too bitter); snow peas (lots of flowers and some small peas) and the kale plants (which are half grown). We also have lots of flowers on our cuke and ground cherry plants. Not sure about the garlic though. Are the scapes always supposed to be curly? More unsettled weather heading my way. We had a heavy rain storm pass through yesterday afternoon and another one coming now. This one could produce rain and funnel clouds. Environment Canada says, "Many of the thunderstorms have produced pea-sized hail. And a few have given 1 centimetre hail or perhaps a little larger. Given the cool temperatures and favourable atmospheric conditions, the hail may be abundant and nearly cover the ground at times. The main concern is damage to tender crops and plants. Isolated brief funnel clouds and wind gusts to 70 km/h may also be associated with a few of these storms. The funnel clouds are not expected to touch down." After two very hot days we had some rain. Sort of. It clouded over and we had a spot of rain here and a spot of rain there. That's it. Today I received a small seed order from Veseys. Four packets, one each of catnip, Butterhead Lettuce, Zesty Mesclun Mixed Greens and 25g Organic Broccoli Sprout Seeds. My order was received on May 11, invoiced 17 My and received this afternoon. I believe the fault is Canada Post. I will plant some of the seeds tomorrow to see how they do. Pal the cat has already tried to commandeer the catnip. Due to many people not looking after their garbage properly, yesterday three bears were shot. The authorities used to capture them and take them out of the area and released them. Then they took them out and shot them. Now they shoot them in situ. I feel relieved, but saddened that we cannot co-exist. And here we go with the rain yet again. Will we ever get a rain free day in these parts? I feel like I am stuck in Groundhog Day. Yet again this afternoon and for the umpteenth time this Spring/Summer we have a thunderstorm passing through and a warning from Environment Canada of potential hail. There is a 30-40% chance of showers each day for the next 5 days. Make it stop!! !